Toño, Juan, and Miguel had parts in their school´s traditional Mexican Christmas play, called a "Pastorela. Church Christmas performance "¿Papá Noel o Cristo?" All of the children in the Home and the other children from church also performed a Christmas play, entitled "¿Papá Noel o Cristo?" It was a take-off of the tv games show "Family Feud" and contrasted the things that people normally think about at Christmas time with the real meaning, Jesus coming to earth. The traditional Christmas meal is served on Christmas eve, and this year we were blessed to be visited by some dear friends from Autlán, Jalisco. We shared a turkey dinner and stayed up late playing games and chatting. Christmas morning was started with breakfast and then a reading of the birth of Jesus in the kid´s new Bibles. Then the gift opening started; cheers and wows, thank you´s and laughter for the next half hour, ending with some very happy kids. Piñatas and spray-snow topped off the celebrations. So much fun on such a special day. Merry Christmas everyone! In November we were finally able to replace the front doors of the Home. The former doors were made of wood and the termites had eaten away at them, leaving little holes all over, and for some reason the wood that had been used would expand and contract with hot and cold temperatures, making the doors stick closed at times and not stay closed at others. This, of course, was a safety hazard, so we designated funds from a donor in Alaska to have new aluminum doors made. These doors come with a push-bar emergency exit door on the two main exits, conforming with the new safety laws for Children´s Homes. Preparing the doorways for the new doors. New back door off the dining room. This one doesn´t have a push-bar. Every year in October we hold a special party to say thank you to people in our town and the surrounding areas for donating to the Home or supporting the Home in some way. 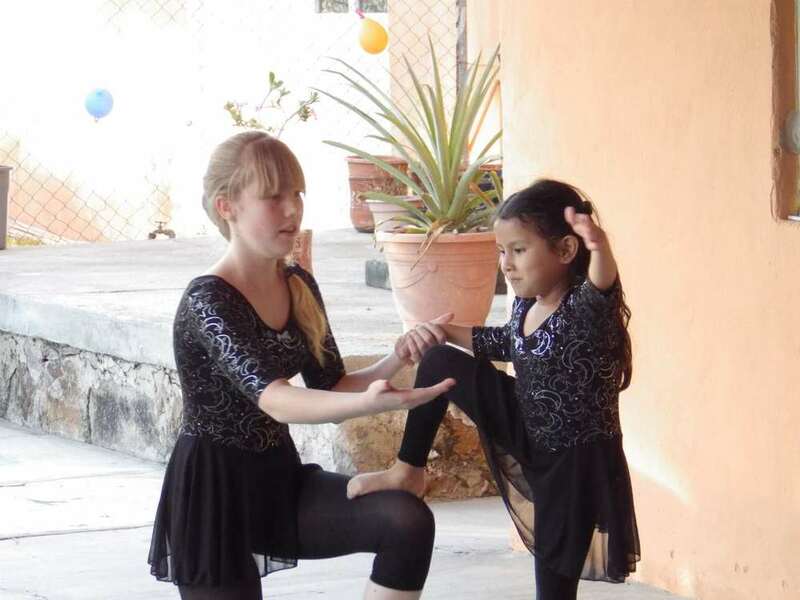 This year the children prepared dramas, songs, and games as their way of saying "Thank you! You are important to us!" Each child chose an adult to hit the piñatas and then the kids in the audience scrambled to grab candy. Katia and Gaby made everyone feel special and loved with their participation. They dressed up in bee suits and then "buzzed" around the audience to the tune of "Beauty and the Bees", giving everyone a hug. Carlos, the president of the Civil Association, gave words of thanks, as did William. They pointed out how necessary people´s donations are and shared some victory stories of great things that have happened in the kid´s lives because they have a safe, loving Home in which to live. Emily and Katia wowed everyone with a gymnastics routine. We had a good turn-out, including dear friends from a church in Guadalajara. Everyone went home content. Something sweet to end a sweet time. Gaby turned 4! She has been with us for 3 years now and is such a joyful little girl. We did a pool party for her since she would rather be in water than anywhere else! What a privilege it was for William to baptize two children from the Home and our 2 daughters last weekend. From the day we announced at church that we were going to have a baptism service, they insisted that they wanted to be baptized, and after asking them questions to find out their motivation, they showed a very good understanding of what baptism symbolizes. The day of the baptisms was beautiful. Below are photos and captions to show the day´s highlights. Such a joyful day! Toño coming out of the water. He was so excited! Fun in the pool after the baptisms. May 5th the kids participated in the church´s Missions Focus weekend. At the end of the Sunday service they dressed as people from different countries and paraded through the church carrying a flag representing their country. They learned important facts about the way people from different countries live, giving them a wider world-view and vision of the diversity in our world. Kid´s Day is an important day in Mexico, celebrated on the 30th of April. The Torre Fuerte C&MA church in Guadalajara invited us to join in with their Kid´s Day celebration at a park behind their church this year and we gladly accepted. The party was very well organized, with teams going to different work stations and then ending together with an obstacle course and skit show. The kids did a craft, played musical instruments, participated in skits, and learned a Bible lesson, as well as enjoying a hot-dog snack and playing on the playground. They came home happy to have spent time with these special friends. Breaks from school are always a fun time when we can do things together that during the school year there just isn´t time for. Here are some highlights from Spring Break. On the first official day of Spring Break we took the kids to Guadalajara. See previous posts for photos of that trip. Then we concentrated on Holy Week. Resurrection Sunday was coming and we did various activities to focus our eyes on Jesus dying and rising again. We made yarn egg decorations with which we decorated the tables at church on Easter Sunday, made cross posters with other children at church on Good Friday, talked at home about each day leading up to Jesus´s death, enjoyed a lamb dinner with other brothers and sisters at church and had an egg hunt. The second week of break was spent doing homework, reading books, going to the park, and playing water games to celebrate the warm weather. On the last day of break we made a bonfire with some friends and gobbled up hot dogs and roasted marshmallows. Roasting marshmallows. Good bye Spring Break! We started out the day playing in the "Parque Metropolitano", a beautiful city park with rolling grassy hills and lots of play areas. After playing at the park we went to McDonalds for happy meals and more play time in the tunnels and slides. Then we took Miguel to his dentist appointment (see post below) and headed home. Such a great way to start out Spring Vacation! We had a great time with the kids in Guadalajara yesterday. We went to a big park to play and then to eat at McDonalds before taking Miguel for his appointment at 4pm. The appointment went well. The ball in his gum was a cyst and in need of attention. The dental surgeon squeezed Miguel in between other appointments so we didn't have to make a return trip. He took out four tooth fragments and drained and cleaned the cyst. The gum bled for quite a while but everything looks fine now. Miguel has pain medicine and an antibiotic. Please keep Miguel in your prayers for a full and safe recovery. March 21st both Katia and Gaby participated in their pre-school´s Spring Festival. Gaby´s first grade class played follow-the-leader to music dressed as animals and flowers. Gaby,dressed as a butterfly, followed very well, but was obviously not very thrilled about being in front of an audience. She was all smiles before and after the performance, though! Katia loved performing and did very well. She danced a typical folkloric dance from the Mexican state of Jalisco and smiled all the way through. Lots of people congratulated her after the performance, which of course made her feel so special. Here is a photo of the two together. Miguel was not able to have the bits of tooth removed, as the dentist found a ball of some sort in the gum that had not been there before. He referred him instead to a specialist in Guadalajara to determine if it is a cyst or an infection. Monday he has this appointment and so we ask again for prayer that the dentist will be able to determine what the ball is and what actions are necessary to take care of it. Today, Saturday the 16th, Miguel has a dentist appointment to remove more pieces of tooth that are bad. Last week he overcame one of his biggest fears and allowed the dentist to remove a rotten tooth that's been hurting him for over a year. Afterwards he had no pain or adverse effects. The appointment today is at 11:00am Mexico City time. Thanks for prayers and support for Miguel. Stay informed with the latest news and happening at the Home. We hope that you'll visit our site often and stay up-to-date with what's happening at the Home and in the lives of the children we care for and the workers in the Home.